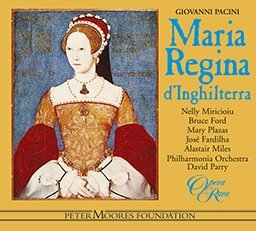 Based on Victor Hugo’s passionate play about Mary Tudor, Maria regina d’Inghilterra was one of Pacini’s most successful operas. 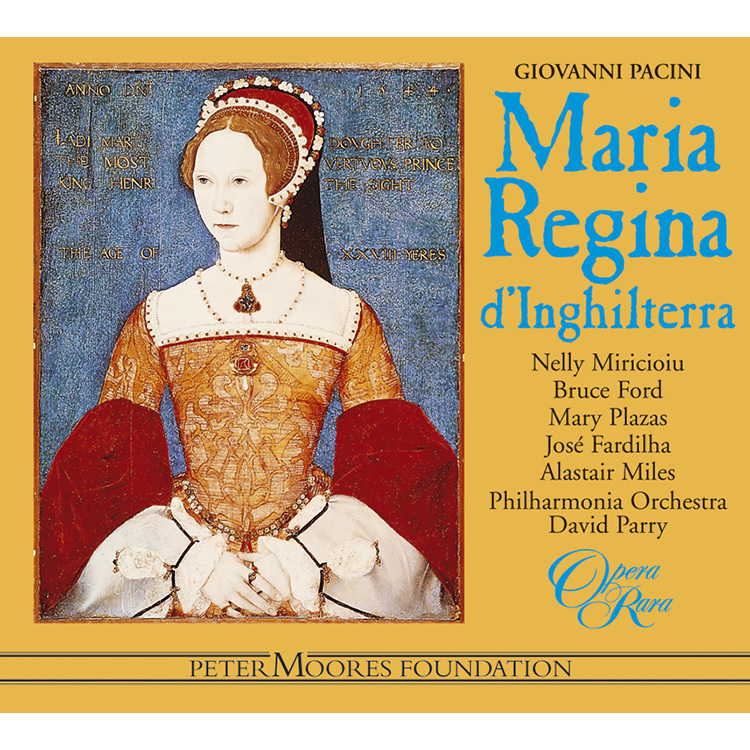 Based on Victor Hugo’s passionate play about Mary Tudor, Maria regina d’Inghilterra was one of Pacini’s most successful operas. Written in 1843, the vocal portrait of the central character is among the composer’s best creations. Joy, tears, outrage and forgiveness are all contained in the vivid vocal characterisation that was Pacini’s hallmark. Booklet includes Italian libretto with English translation. 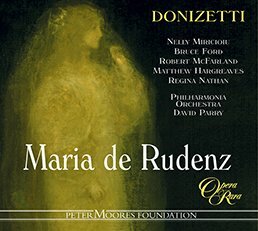 04 Maria, regina d’Inghilterra: Act I scena II: Duetto: Al nostro tetto or torna – scena III: Doman saro felice! – scena IV: T’arresta! 06 Maria, regina d’Inghilterra: Act I scena V: Duetto: Ella mi attende, o gioia! 17 Maria, regina d’Inghilterra: Act II scena VIII: Mira colei – scena IX: Tu! E mirar tant’alto osavi ?? 18 Maria, regina d’Inghilterra: Act II scena IX: Scena e duetto: Abbracciami. Deh! Paingi sul mio cor! 19 Maria, regina d’Inghilterra: Act II scena IX: Finale Secondo: Pera l’indegno! Arrestati ? – scena X: Venite tutti – scena XI: Gran Dio! 20 Maria, regina d’Inghilterra: Act II scena XI: Finale Secondo: Largo: Folle! Dall’ Anglo soglio – scena XII: Giustizia! 23 Maria, regina d’Inghilterra: Act III scena II: Aria: Ei morra – morra! Gran Dio! 28 Maria, regina d’Inghilterra: Act III scena VII: Caballetta: Tu m’ami ancora! Un’estasi – scena VIII: Presto e il battel! 32 Maria, regina d’Inghilterra: Act III scena XI: Bada, Raoul: tu stesso – scena XII: Ahime! 33 Maria, regina d’Inghilterra: Act III scena XII: Duetto: Qual ora tremenda! Il cor mi si Agghiaccia! ACT I. The action takes place in 1553, the first year of the reign of Mary I. It is a fine night on the south bank of the river Thames. Across the river lies the city of London, all lit up as for a festival. Closer at hand pleasure-boats pass to and fro, and the voices of their occupants can be heard as they extol the beauty of the evening and the brilliance of the city in the distance (Chorus, ‘Forza ai remi’). A number of cloaked men stealthily make their appearance. Seeing that the coast is clear, they beckon their leader to join them. This is Gualtiero Churchill, the Lord Chancellor of England. His followers have led him to this spot because they have discovered that his arch-enemy, Riccardo Fenimoore, a Scottish exile who is now the favourite of the Queen, has a mistress living here in a rustic cottage. Each night, they report, he comes by boat to visit her. Gualtiero gloats to think that evidence is within his grasp which may bring his enemy to ruin. Already the Queen suspects that Fenimoore is unfaithful: if it can be proved that he keeps a mistress, he will certainly fall from favour, and perhaps even be brought to the scaffold (Cavatina, ‘T’ho pur colto’). As a boat approaches, Gualtiero and his followers retire into the shadows. A middle-aged man and a young woman disembark. The man is Ernesto Malcolm, a commoner [in Victor Hugo’s play an artisan, a fashioner of elaborately wrought sword hilts], the owner of the cottage. The young woman is Clotilde, an orphan whom he had found and sheltered as a child, and who is to marry him the following day. Remarking that she seems sad, he asks what troubles her, and seeks assurance that she still loves him. She avoids a direct answer, merely saying that she owes him everything and will certainly be his. Ernesto is so deeply in love that he is oblivious of her prevarication (Duet, ‘Altro dal ciel non chiedo’). There is, however, only too much reason for her low spirits, for she has fallen in love with a stranger and is now a prey to conscience. As they approach the cottage, Ernesto bids her go in, telling her that he must return to London to wait upon a nobleman. Tenderly he takes leave of her, bidding her look forward to the morrow (‘Ah! tergi quelle lacrime’). Before he can depart, he is accosted by Gualtiero, who, without revealing his identity, mystifies him by warning him not to go far from his house, but to keep a sharp watch lest anyone cross his threshold. As Gualtiero withdraws, Ernesto follows him, seeking further explanation. The sound of a barcarolle comes floating over the waters (Barcarolle, ‘Quando assisa a me d’accanto’). It is Fenimoore, serenading Clotilde. When he steps ashore, he is dressed, not as the courtier he really is, but in simple clothes and a cloak. He goes towards the house, clapping his hands as a signal, but at this moment Ernesto, who has lost Gualtiero in the darkness, returns. The two confront each other, Ernesto demanding the stranger’s name and asking what business brings him there at that hour (Duet, ‘Chi sei tu? Che vuoi? Che chiedi?’). Fenimoore scornfully refuses to reply and demands to be allowed to approach the door where, he claims, his love awaits him. Struck by the suspicion that Clotilde may have betrayed him, Ernesto is at first stunned, but then, recovering himself, he accuses Fenimoore of lying and orders him to be gone. Fenimoore’s answer is to draw a letter from his pocket, and Ernesto is crushed to recognise Clotilde’s handwriting. His dismay turns to violent anger as Fenimoore patronisingly tosses him a purse of gold: he is prevented from throwing himself upon his rival only by the latter’s drawing a sword and presenting it to his throat. He nevertheless vows to have vengeance (‘Ah! un pugnale a me porgete’), while Fenimoore, privately determining that he must do away with this man who stands between him and his love, haughtily departs. Left alone, Ernesto reviles himself for letting the stranger escape, without so much as forcing him to reveal his name. He goes to pick up the purse of gold, but finds as well a dagger which Fenimoore had inadvertently let drop. At this moment Gualtiero reappears. Ernesto asks him if he recognises the crest on the dagger, and, receiving an affirmative reply, exhorts him to help him gain revenge: henceforth this must be his only object in life (Duet, ‘La vita io la destesto’). Gualtiero, who looks upon him as a potentially useful tool in his own personal struggle with Fenimoore, strikes an ominous bargain with him, promising to help him if, in return, he will place his life at his disposal (‘Ah! il giuro tremendo’). ACT II. A hall in Westminster Palace. Lords and ladies comment on the festivities that are taking place in honour of Fenimoore, who has just been created Earl of Clambrassil [‘Clanbrassil’ in Victor Hugo’s play], and who thus succeeds to the title and estates of a deceased peer, Lord Talbot (Chorus, ‘Tutto è festa a noi d’intorno’). Some of the courtiers ask whether Talbot did not leave an heir: others reply that some members of the Parliament believe that he did, but that none is bold enough to incur the displeasure of the Queen’s favourite by openly saying so. Gualtiero is the only person brave and proud enough to stand up against Fenimoore. The Queen enters. She is deeply disturbed, for Gualtiero, whose return to court she is every moment expecting, has told her of his suspicions of Fenimoore’s infidelity. She is torn by conflicting emotions: in one breath she tells herself that she loves Fenimoore more than the throne, in the next she determines to trample him underfoot should he prove guilty (Aria, ‘In quel volto accolse il cielo’). The peers of the realm beg leave to wait upon her, and urge her to decide whether or not she wishes to accept a proposal of marriage from the King of Spain. She replies that she will decide in due course, but it is clear that her mind is preoccupied with more immediate matters. It is only when a page announces Fenimoore that she is aroused from her reverie. Her crown, she now declares, has no need of the prestige of a foreign alliance: her throne and heart will be given only when she is genuinely in love (‘La corona che cinge il mio crine’). She thanks the peers for their concern for her welfare and dismisses them. When Fenimoore enters she comes straight to the point, telling him that he has been accused of deliberately concealing Lord Talbot’s heir in order to gain unlawful possession of his estates. She herself, she assures him, does not believe him guilty of this charge, but there is another from which he must clear himself. In terror lest his transgression should have been discovered, Fenimoore begs her to speak (Duet, ‘Parla… Oh ciel! su gli occhi tuoi’). She has no need to state the exact nature of the crime – they both know exactly what she has in mind – but Fenimoore in any case simulates outraged innocence so well that she is convinced he is guiltless (‘Con quel dir, con quell’aspetto’). Believing that he has weathered the storm, he demands to know the names of his accusers, but she refuses to tell him, promising that once his innocence has been established, his advancement will be so rapid that his enemies will fall prostrate before him (‘Va… fido alla tua regina’). Fenimoore protests that advancement means nothing to him: his whole happiness lies in the love that he and Maria share together. The Queen retires to her private apartments, and Fenimoore, alerted to the fact that his enemies must be seeking proofs of his guilt, determines to have Clotilde abducted and carried off elsewhere. As he hurries away to put his plan into action, Gualtiero cautiously enters and orders a page to inform the Queen that he brings her grave news. Maria returns, anxiously enquiring whether Gualtiero’s followers were not mistaken. He replies that he wishes it were so, but that there is no longer any doubt of Fenimoore’s loving another. His proof, as he withdraws, is to usher in Clotilde. Momentarily abashed to find herself face to face with her rival, Maria greets her haughtily. But Clotilde, overcome with grief and shame, falls to her knees. She tells of her innocent life on the banks of the Thames (Duet, ‘Innocente al fiume in riva’) and of how, despite her earnest endeavours to resist him, she fell in love with this unknown stranger. The Queen is touched by her manifest remorse and raises her up, assuring her that her anger will fall on Fenimoore’s head, not on hers. She bids her return to her home, but this only provokes a further tearful confession from Clotilde, as she tells how she has betrayed Ernesto. When the Queen hears that she is an orphan, she enquires after her parents, and Clotilde shows her an amulet which she wears round her neck, saying that she had it from her mother who wore it as a last memento of her husband. The Queen is astonished to recognise the crest of the Talbots, and even more aghast when Clotilde tells how Fenimoore would often ask her to give it to him, a request which she resolutely refused. Maria embraces her, and they mingle their tears together (‘Ah! scorra questa lacrima’). Summoning all her court, Maria orders Fenimoore to be brought before her. As he appears, she conceals Clotilde behind her. Fenimoore approaches to kiss the Queen’s hand, but, stepping swiftly aside, she leaves him face to face with Clotilde. He is taken completely by surprise, and the Queen pours her anger on his head (Finale, ‘Stolta! dall’Anglo soglio’). But instead of confessing his guilt, Fenimoore tries to bluster his way out of the situation by denying that he knows Clotilde. Inexorably the Queen reveals the facts: she declares Clotilde Lord Talbot’s daughter and reinstates her in all her possessions. As for Fenimoore – just as she raised him from the dust, so she will return him to the dust. Fenimoore tries to protest, but at a sign from Gualtiero a door opens and Ernesto enters. Accusing Fenimoore of an even greater crime, he produces the dagger and the purse of gold, swearing, as Gualtiero has instructed him, that Fenimoore gave him both, one as the instrument and the other as the reward for murdering the Queen. Even Fenimoore, for all his effrontery, is speechless at this monstrous lie, and gives himself utterly up for lost as he and Ernesto are led away to prison. ACT III, SCENE 1. A vestibule in the palace. As the populace questions the Queen’s soldiers, we learn that both Fenimoore and Ernesto have been condemned to death, the former to die that very day, the latter the day after (Chorus, ‘Narrate: or dei colpevoli’). Clotilde hears the news in extreme distress (Aria, ‘Ei morrà! morrà!’). She cannot bear to think that Ernesto, whom she has betrayed, should die while she lives on, and she determines to do all in her power to save him (‘Ciel che vedi il mio rimorso’). SCENE 2. A corridor in the Tower of London with several cells opening off it. Gualtiero, in conversation with Raoul, the Lieutenant of the Tower, reveals that the Queen is still vacillating and delaying the execution of the sentence. As the Lieutenant withdraws, Gualtiero offers him a bribe, promising him whatever reward he pleases, providing that Fenimoore dies. A secret door opens, and the Queen appears. She has not yet actually signed the sentence, and declares that she has come to sift the evidence for herself. Gualtiero tries to convince her that all England is calling for Fenimoore’s death. Even as he speaks, a tumult is heard outside, and a page brings word that an immense crowd has gathered. 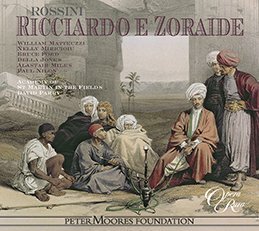 The Queen orders Gualtiero to go and restore order, but instead he opens a window so that she can hear the clamour of voices (Chorus of revolt, ‘Morte, morte all’infame Scozzese’). He appears to have convinced her, for she seizes the sentence, signs it, and orders that the execution be carried out within the hour. But as soon as she is alone, we realise that she is still scheming to save Fenimoore. She intends that the condemned man shall go to the scaffold covered by a black veil, and it is clear that, if she can so manage it, the man beneath the veil will be Ernesto rather than Fenimoore. Clotilde appears. She has bribed her way into the prison to see Ernesto. At this point a major misunderstanding occurs, for the Queen assumes that she has come to see Fenimoore, and that his rescue can safely be left in her hands. Since she is anxious to return to the palace, she summons a gaoler, and orders him to allow whichever of the prisoners Clotilde shall indicate to escape to safety through a secret passage to the Thames. Clotilde is under no misapprehension as to the Queen’s misunderstanding, but her loyalties are to Ernesto, not to Fenimoore. She orders the gaoler to bring Ernesto to her. There are no recriminations on Ernesto’s part. He is overwhelmed that, now a duchess, Clotilde should still think of him, and amazed to see her kneeling before him, accusing herself of betraying him. He raises her, blaming himself for having dared to fall in love with her, and acknowledging the justice of his fate (Duet, ‘Tradirmi tu? deh! taci’). When she reveals that she has come to save him, he declares that, without her, he has no wish to live. At last she realises that he not only forgives her but still loves her. Ecstatically they throw themselves into each other’s arms (Tu m’ami ancora, un estasi’). SCENE 3. A dimly lit cell in the Tower. Fenimoore awaits the hour of execution. He still carries a scarf, the gift of the Queen, and momentarily thinks of trying to send it to her. But then, realising that he is surrounded by enemies, he resigns himself to die. He is not untroubled by conscience, for the memory of his seduction of Clotilde fills him with remorse (Aria, ‘Ah! m’amò qual aman gli angeli’). Officers of justice come to lead him to the scaffold. Noticing a tear of sympathy on one man’s cheek, he clutches at this last straw of hope, and asks him to deliver the scarf to the Queen. The final words he utters in the opera are an expression of hope that he may yet be saved (‘Ancor d’un sogno roseo’). SCENE 4. A vestibule in the Tower, through which the procession must pass on its way to the scaffold. The Queen is conferring with Raoul, the Lieutenant, and with Gualtiero. Ernesto has been apprehended as he tried to escape to the river, and the Queen orders that he should perish in Fenimoore’s place. The Lieutenant withdraws. Maria is so absorbed in her thoughts that she does not notice that Gualtiero is leaving with him. As a funeral march is heard, Clotilde enters in alarm. In increasing distress – a distress that affects them both – she and the Queen watch a procession of soldiers, with the veiled prisoner in their midst, cross the back of the stage (Duettino, ‘Qual ora tremenda!’). But then, as the prisoner approaches the scaffold, the Queen exclaims in relief that it is, after all, not Fenimoore but Ernesto. Clotilde is appalled. She begs the Queen to be merciful, then determines to try herself to reveal to the executioners the mistake they are making. The Queen bars her way. Clotilde denounces her as an inhuman tigress, but then, as if in a moment of inspiration, calls on Heaven and suddenly declares that she does not believe it is Ernesto at all: if Gualtiero has had any part in the proceedings, it is far more likely to be Fenimoore. Now it is the Queen’s turn to be tortured by anxiety, but before she can move to have the execution suspended, the sound of a drumroll is heard. There is a moment of agonised suspense as both women wonder who has died and who still lives. Then Gualtiero appears, leading Ernesto by the hand. Justice, he declares, has been done: Fenimoore has been beheaded. Reconciling herself to a fait accompli, Maria prays that Heaven may be placated by her tears, and may forgive her too fond indulgence of an unwise love (Aria finale, ‘Ciel, quest’amara lacrima’). Then, in a state of mounting ecstasy, she imagines that her prayer has been heard and that God’s pardon is descending upon her (‘Ma già la mia prece sen vola all’Eterno’). At the height of her ecstasy, she collapses in the arms of her ladies-in-waiting.